In Texas, going fishing down on the coast is a weekend activity that many enjoy year-round. However, deciding what to pack to keep your hunger at bay for a day or two out on the water can be a daunting task. Let’s face it – peanut butter and jelly and ham and cheese roll-ups can only indulge one so far. 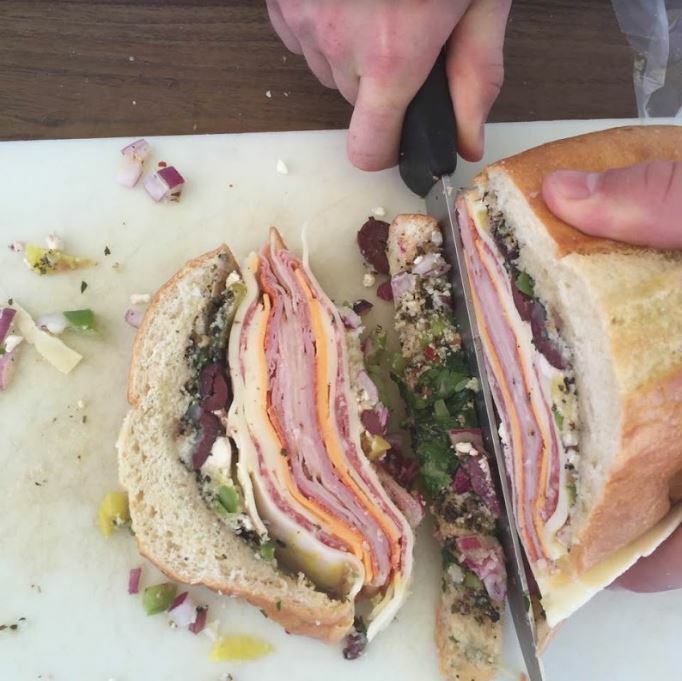 Over the last 15 years, our Uncle Chris has perfected what we like to call the “fishing sandwich,” and it has since become a staple of our family gatherings down at Port Aransas, whether the beach or the bay is the activity of the day. These sandwiches can feed a hungry group of 10-15 whether you are out on the water or relaxing on the warm sand with an ice-cold beverage. 3-4 lb. (total) of your favorite lunch meats, thinly sliced. We use ham, turkey, salami, bologna and prosciutto. Add or take out any other ingredients to your liking, such as tomatoes, spinach, balsamic vinegar, etc. 1. Cut bread loaves length wise in half to separate the top and bottom of the loaves. 2. Mince together the garlic, bell pepper, red onion and fresh parsley together and drain excess juice. Put ½ of the spread on each side of the bread. 3. Sprinkle oregano, basil, dry mustard, coarse black pepper, and crushed red pepper on both sides of bread, or Gourmet Italian Choice instead, if desired. 4. Sprinkle Parmesan cheese heavily on both sides. 5. 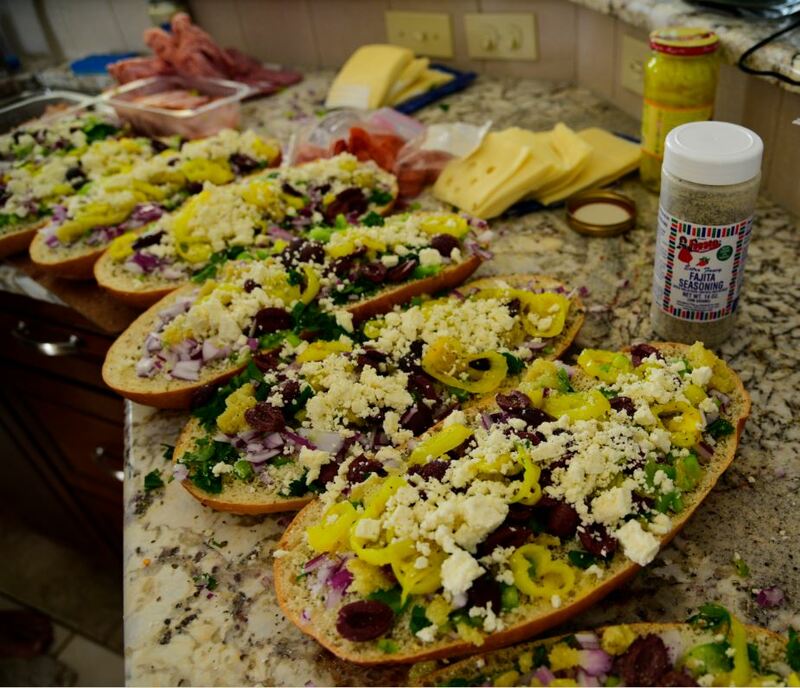 Add black olives and Pepperoncini – arrange equally on both sides of the bread. Sprinkle with Fajita Seasoning to taste. Slowly pour the Italian dressing on both sides, covering all the vegetables. 6. Layer cheese and meats on top, finishing up with a layer of Feta. 7. Close sandwiches, wrap tightly in plastic wrap and let all of those delicious flavors meld together overnight in fridge. Try not to lose any sleep about how delicious these are going to be the next day! 8. Before hitting the boat ramp or the beach, cut the sandwich into 2 inch slices, and pack 1 slice per sandwich bag and toss them in the cooler to be accessible at a moment’s notice of hunger! For the brave, take the sandwich to the beach whole – we’d love to see you bite into that 8-inch tall sandwich! Just remember to take a photo and share it with us 😉 Of course, for everyone else, don’t forget to take along your knife and cutting board. Even if the rain puts a damper on your sunbathing or you don’t catch the big one, let’s face it – your belly will be mighty happy!